A shopping mall like no other, Garuda mall is Bangalore’s premier landmark. Located close to Brigade road, the Magrath road the place has earned repute as being the place to see and be seen in. Garuda mall opened to applause and acceptance as it is one of the largest and best malls in South India. The doors were thrown open to public patrons in May 2005. Spread over a total of 126,000 square meters, the shopping mall boasts of much more than just retail shopping haven. The mall has six floors of retail nirvana, with stores like Jashn, Lush, Swarovski, Louis Phillipe, Mango and Marks and Spencer amidst numerous others. The international brands mingled with local stores make shopping at Garuda fun and interesting. From department stores to gold jewelry, there is not much that you cannot find at Garuda. INOX at Garuda is a noteworthy theatre of repute. Headquartered in Mumbai, INOX leisure Limited has become synonymous with the movie experience. The brand owns and operates over 290 screens in 74 multiplexes in 40 cities across India. With numerous awards and recognition attesting that INOX truly does magnify the pleasure in the movie theater, the brand is continuously expanding to newer shrores. Apart from the screens that it operates in the Garuda mall, INOX has theater locations in the Garuda Swagath Mall, Mantri Square and Central in Mantri Junction in Bangalore. INOX Garuda boasts of a total of five screens capable of seating 1,500 people safely. There is an activity center also for children where vigilant care takers are available for the safety of the children in the play area. If long movies with an interval in between does not appeal to you, then the shorter and infinitely more thrilling 4D ride in a theater just off the INOX is bound to get the adrenaline flowing. The Funmax 4D theater plays short movies complete with visual and other sensory stimuli designed to take you right into the heart of the action. The special effects that are nothing short of a roller coaster ride include seats that move, mist, face blast, vibration, leg ticklers and neck blast. With rides designed for kids, a playpen and video games time flies at Funmax theaters. They also organize birthday parties. Amoeba is now within Garuda. Keeping with its reputation of being more than just a shopping mall, patrons can now indulge in video games, car races, shooting matches, pinball games, air hockey and even bowling. If thrills and spills is your cup of tea, then the mall has something that will chill your spine at the Scary house. A mere five minute walk inside has most patrons screaming and running for the exit, but not before a bogeyman stands between you and the door with a bloody axe in hand. All the different rooms within the scary house have hidden surprises around every room, designed specifically to evoke fear. The dim lighting and the scary music only add to the experience. For those with weaker hearts and appetites for fear, the mirror maze is the ideal getaway. With a maze that is every bit as misleading and misguiding as an actual maze in the middle of nowhere, the ride will be one to remember. With seasonal events like the Voice of Bangalore, Shopping festival and Superkids awards, there is always something going on in the mall. Garuda mall has elevated drinking and dining also to new heights of a thrilling adventure. The options and cuisines on offer are seemingly endless. Patrons can choose from simple chai and coffee to mouthwatering delicacies from around the world. With fine dining options like Kobe Sizzlers and pubs like Indi and Bull and Bush, nobody can hope to run out of choices. If speed is what you are looking for then the food court can help you feel satiated in less time than you will spend making up your mind. 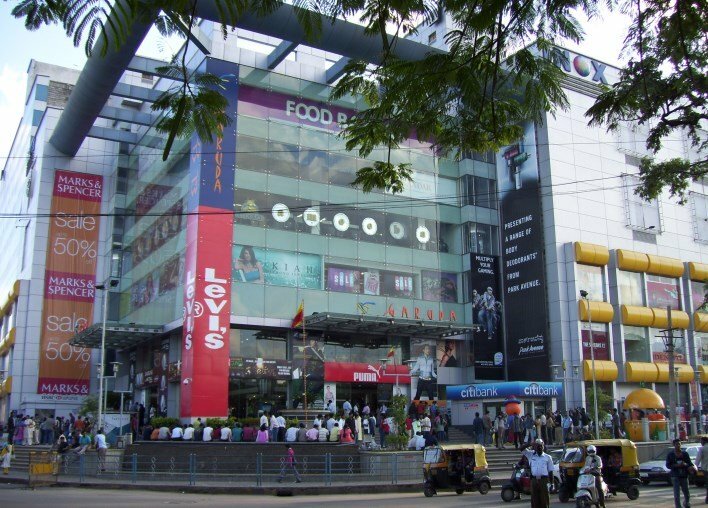 Garuda mall is an entertainment pit stop in the fast paced life that has become the hallmark of Bangalore city. With seemingly endless parking spots, getting there is the only hassle. The mall proudly offers parking spots for two and four wheelers. With separate parking area for visitors and tenants, patrons and tenants will never have to squabble or run out of parking areas. Lift connectivity on all 11 floors, 1050 car slots, parking staff, automated ticket vending machines, computerized billing systems, CCTV monitoring and security patrols make the visiting the mall a pleasurable experience. Although the mall has operated smoothly for a long period of time, controversies have often marred the shiny exterior from time to time. One of the many lifts in the building crashed shortly after its opening in 2005. A young boy fell through the gap between the railings to his death in 2007. Both the incidents though unrelated lead to a slew of added safety and security measures that are currently in place. Violations against BBMP rules lead to surprise inspections by the government body in 2011. Though the land is owned by BBMP, the owner and the government have been at loggerheads. Allegations about renting out more shops on each floor than agreed for, encroachment on storm water drains, converting parking spaces into food courts and ill treatment of government representatives have dogged the good reputation that the mall has earned over time. Despite all the allegations and accusations, the mall has become a landmark in Bangalore, a hallmark of entertainment and endless hours of fun.